According to SSA's actuaries, the 6.2 Percent Solution would eliminate Social Security's long-range actuarial deficit and restore the system to permanent "sustainable solvency." 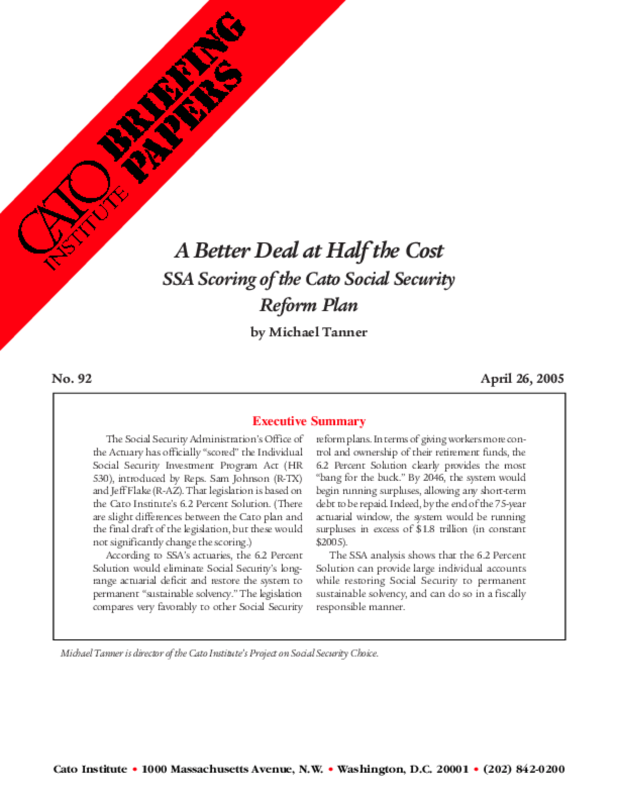 The legislation compares very favorably to other Social Security reform plans. In terms of giving workers more control and ownership of their retirement funds, the 6.2 Percent Solution clearly provides the most "bang for the buck." By 2046, the system would begin running surpluses, allowing any short-term debt to be repaid. Indeed, by the end of the 75-year actuarial window, the system would be running surpluses in excess of $1.8 trillion (in constant $2005). The SSA analysis shows that the 6.2 Percent Solution can provide large individual accounts while restoring Social Security to permanent sustainable solvency, and can do so in a fiscally responsible manner.